In the aftermath of the Chelyabinsk fireball last month, there have been increasing calls to identify asteroids on a collision course with Earth and develop technologies to deflect them. This would be a very stupid thing to do. The reason for this can be seen in figure 1, below. In part A, this figure shows the minimum deflection necessary to make an asteroid on a collision course with Earth to miss. The deflection angle depends on how far from Earth this deflection occurs; the farther away, the smaller the angle. In practice, very small angles from very far away would be used. 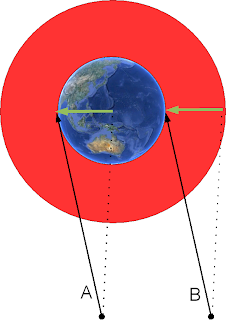 The green line shows the minimum translational distance an asteroid must be deflected in order to miss the Earth. Figure 1. An illustration for how the deflection needed to make an asteroid miss can be used to make many more hit. The problem with such a system is shown in part B of the figure. Here, an identical deflection is applied to a harmless asteroid that never would have hit Earth. However, by deflecting it towards the Earth, this harmless rock ends up exploding in the atmosphere. For a rock the size of the Chelyabinsk bolide, this is similar in force to a large nuclear weapon. The area of the red circle- the smallest radius necessary to protect the earth- is three times the cross section of the earth. So for every rock you deflect, there will be at least three harmless rocks that can be turned into weapons of mass destruction. By definition, a “planetary defense system” turns every rock that passes close to the Earth into a potential weapon of mass destruction. Who would actually crash a space rock into a populated area of the Earth? The same people who crash airplanes into skyscrapers of course. And while only a few rouge countries can launch satellites, any spacecraft in radio contact with Earth can potentially be hijacked by a hacker on Earth with enough chicken wire to erect a makeshift dish in a desert. Amateurs already pick up signals from our most distant space probes; an asteroid deflection mission would be a magnet for every doomsday cult, terrorist fanatic, delusional hacker, and other misanthropes whose imagination had previously been limited to shooting up schools. Obviously nobody is going to design a space deflector to be hackable, but then the drone the Iranians hijacked wasn’t supposed to be vulnerable to those sorts of attacks either. The threat of an asteroid impact is miniscule. More people were killed in floods this week than were killed by impacts in the known history of the human race. A quick glance at the morphology of our planet will explain why. Even the giant extinction-causing impacts are less common than large flood basalt eruptions of similar ecological lethality. But developing the technology to deflect asteroids potentially gives all the wrong people access to a weapon the size of a large hydrogen bomb for a fraction of the development cost. This is not a smart thing to do.